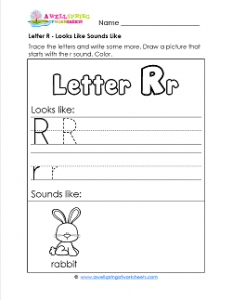 The little rabbit on this letter r looks like sounds like worksheet is so adorable. Don’t scare him away. Have him help your kids come up with another word that starts with r. They’ll draw it right next to him so maybe it should be something that won’t scare him away. How about a rock or a radish? A rocket will surely spook him! Before they get carried away with that have them trace and write the letter Rr several times. And don’t forget to color.